Powers/Abilities: As an egg he generated large amounts of radiation sufficient to power a space ship's star drive. As a hatchling he had six legs and two arms, as well as a long, scorpion-like tail. His talons and mandibles were sharp and able to rend Huntarr's durable flesh. He could extrude a blade that could inject Huntarr with a mutagenic substance. In mature form, Scion possessed superhuman strength and durability. He could alter his size, form, and appearance at will, and could recover from apparent destruction. He could communicate with certain beings across the dimensional walls. He could harness the vast power of a star ship and use it to pierce the otherwise virtually impenetrable Spacewall. (Micronauts II#1) - The being who would become Scion was amongst the eggs spawned and incubated by the Child of the Makers. (Micronauts II#2) - Sensing the power within the eggs, Huntarr examined one of them, resulting in the Child of the Makers capturing and mutating him (thinking it was helping him). Upon his release, Huntarr brought the egg aboard the starship Endeavor, and he used his newly mutated form to transmit the egg's power into the Endeavor's stardrive, enabling them to escape the Child of the Makers in hyperspace and return to normal space. (Micronauts II#3-7 - BTS) - The egg continued to serve as power source of the Endeavor as they arrived at the Confluence of Stars. (Micronauts II#8) - The Micronauts--except Huntarr--began dying from the radiation they had been exposed to from the Child of the Makers. The egg taken by Huntarr then hatched, releasing a monstrous creature that seemingly attacked Huntarr, eventually extruding and stabbing him with a blade. This mutated Huntarr into a giant amorphous form which then cured the remaining Micronauts before reverting to its standard form. No sooner had Huntarr began his own metamorphosis than the hatchling retreated to the ship's depths. 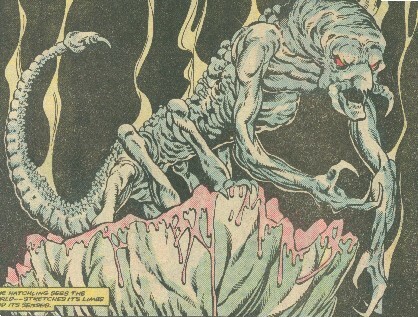 (Micronauts II#9) - The hatchling remained hidden within the Endeavor. (Micronauts II#10) - As the Endeavor arrived at the Spacewall, the somewhat mutated/evolved hatchling stirred. (Micronauts II#11) - With all efforts to pierce the Spacewall having failed, the fully mutated/evolved Scion appeared at the bridge of the Endeavor and introduced himself, announcing that he was assuming captaincy of the ship and leadership of the Micronauts. (Micronauts II#12) - While the rest of the Micronauts fell under Scion's command, Acroyear rebelled and attacked him until Huntarr--under Scion's control--contained Acroyear. Solitaire then confronted Scion and insisted the fighting stop; recognizing Solitaire's nature and acknowledging her power, Scion acquiesced, though he did blast off Bug when he leapt atop his back. Scion told the Micronauts that he would help them breach the Spacewall, and in return they would help him save all that they held dear--and more. Following Scion's commands, the Micronauts flew the Endeavor full speed at a fold in the Spacewall, and he climbed out on its hull and absorbed the power of its main thruster engine. Using this new power, Scion allowed the ship to breach the Spacewall, though he was temporarily stunned, and Marionette rescued him. He told each of the Micronauts that he was their brother. (Micronauts II#13) - Scion told the Micronauts of the pain in the Microverse, after which he led them to the planet Fiame, where the found a ship which they accessed via the glyphs burnt into Microtron by the laser planet. Scion led them in fighting their way into the ship past its owners, the Wanderers. The Micronauts found a pylon marked with the glyphs of the three Keys to the Enigma Force. When the glyphs on Solitaire's necklace were pressed against the glyphs on the pylon, the Micronauts were spoken to by the ship's owners, the Wanderers. To ensure that the design of the Makers not perish, Scion claimed the glyphs of the Keys to the Enigma Force (or the Keys themselves), taking up their power and the promises that they represented. Armed with them, Scion intended to save the Microverse. Recognizing his true nature, the Wanderers allowed Scion to claim the Keys in peace. (Micronauts II#14) - Scion revealed the Keys to the Enigma Force as glyphs from the language of the Makers, part of the code which embodies the power they used to create the Spiral Path. Scion then brought the Micronauts to the planet Aegis, the refuge for all those driven from their homes by the Pain sweeping the Microverse. While holding one of the Keys, Scion secretly caused Bug to mutate, devolving and dissolving, but Solitaire and Marionette saved him. (Micronauts II#15 - BTS) - Scion may or may not have been present when Marionette explained how her legs had been taken from the dancer Diarmid. (Micronauts II#16) - After revealing the recent history of the Micronauts to a trio of insectivorids on Aegis, Scion summoned the Beyonder to the Microverse. 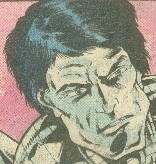 Scion convinced the Beyonder to obliterate the planets Darijan, Athaurus, and Hytras in an effort to slow the spread of the Pain. This was done to create a firebreak, destroying the planets in the Pain's path before it could spread to them. Scion then revealed to the Micronauts the origin of the Pain to the Micronauts, telling them why he had done what he did, but they didn't trust him. They attacked Scion, and Huntarr spread his energies--power granted from the Child of the Makers--enabling the Micronauts to seemingly destroyed Scion. 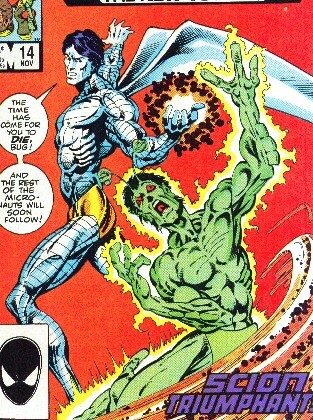 Reviving in new form after the Micronauts had departed, Scion thanked the Beyonder for his involvement, revealing that he had manipulated the Micronauts to attack him so that they could be "fully activated" by Huntarr. Acknowledging that the Beyonder could remake the entire cosmos with a thought, Scion explained that the Microverse must be healed as life is healed--by its own forces. (Micronauts II#18 (fb) - BTS) - Scion allied himself with Princess Cilicia and the Acroyear fleet. (Micronauts II#18) - Huntarr activated Rann, making him, too, immune to the Pain. The Acroyear fleet then arrived, intending to destroy Homeworld to end the Pain. Cilicia eventually ordered Scion to do just that, but Scion altered their controls so that they merely severed the columns connecting the individual planetoids of Homeworld, sending the planetoids to "their necessary positions." (Micronauts II#19 - BTS) - When Solitaire again tried to convince the Micronauts to leave Homeworld, Scion revealed his presence and fought Solitaire, who was convinced to reveal her true nature. Scion and Solitaire confirmed Rann's earlier statement that the Micronauts would have to sacrifice their lives to save the Microverse. Rann then showed them how they could use the Prometheus Pits to make the spheres--now spread across the Spiral Path--to serve as a blockade against the advance of Pain and fear. 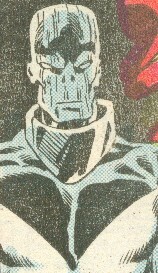 Scion further revealed that the Micronauts recent experiences had changed them into Prime Beings like himself and Solitaire. They would each give birth to life on one of the former planetoids of Homeworld, and that that life would grow out of the Pain that assailed the Microverse. Each cell in their bodies would become a seed sown over the world and a refutation of the power of Pain. Scion then led the Micronauts into one of the Pits, but they were assailed by defense mechanisms as the Pits were designed only to follow the commands of Karza. Rann rushed to don a suit of Karza's armor, after which the Pits obeyed his orders. Scion, Bug, Fireflyte, Acroyear, and Huntarr all entered the pits, but Solitaire refused to join Bug in his sacrifice. Rann and Marionette stayed behind to control the instrumentation. (Micronauts II#20) - The Makers watched from their thinly veiled realm as the wave of Pain spread across the Microverse. Scion first had to gain doubt before he could fully enter into his role as a Prime Being. The armor of Karza clouded Rann's mind, making him tell Marionette that they need not sacrifice themselves. At the last second, Marionette tackled him into the Prometheus Pit, and they joined Scion, Bug, Fireflyte, Acroyear, and Huntarr in sacrificing themselves to form new life across the former planetoids of Homeworld. Their life energies became a force of hope that contained the Pain of the Microverse, allowing life to begin again. Comments: Created by Peter Gillis, Kelley Jones, and Danny Bulanadi. While Bug, Marionette, and Arcturus Rann were reborn at some point, Scion and the rest of the Micronauts apparently met their final end in restoring the Microverse. I loved the art, but the plot was too trippy for me. Just say the name, "Scion" and I say, "SciWhuh?"